With the seasonal changes around the year, one may find it hard to clean the carpets, rubbing and washing carpets in hot sweaty weather. Naa! Does not sound that attractive or even shivering in cold (or in some places snowy) weather but still fighting with the stains, not pleasant either. And buying a new carpet after every few months, or even yearly can make a hole in your pockets. Then you might think of a helper, why not Bissell 3624 portable carpet cleaner? The new Bissell 3624 SpotClean Professional portable carpet cleaner is the most powerful and compact designed carpet and spot cleaner. It comes with a variety of features and qualities that you definitely will think as a one time expense and long term profit. It is specially designed for chefs and house wives who have a lot of cleaning to do through out on daily basis. 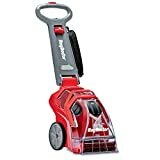 Bissell 3624 SpotClean has the superior 5.7 ampere motor producing the most power for its purpose to remove every stain and spot nearly perfectly. The power produced is very helpful in digging out stains from depths and cleanse the carpet efficiently. It is the light weighted 13.2 lb compact cleaner that is portable and easy to carry. You will not have to worry about the heavy weight specially if you are pregnant or an old person. Carrying it is as easy as carrying some boxes of pizza or cupcakes or what ever you like to carry. Moving it is also as easy as making a pancake. Its small size also makes it easy to store anywhere without worrying much. The cleaner has a special feature of two tank system with one tank having clean water and the other having dirty water. This two tank system is much better then the common one tank system in which the water is mixed, making it hard to CLEAN after first hour. Looking at the key features, should I move to the most important part? Benefits.. Yeah! 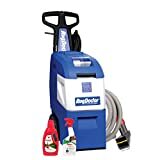 Why would I personally like to buy Bissell 3624 SpotClean Professional portable carpet cleaner? hmm… lets look at the following points I experienced myself. 1. Why should anyone buy this particular cleaner instead of others? 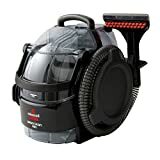 Well, Bissell 3624 portable carpet cleaner give the most power and comes with the largest tank size. 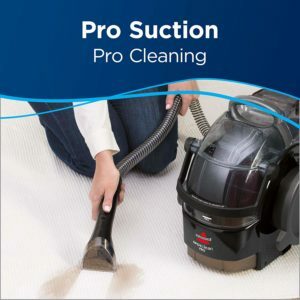 It is easy to use and store and works much better then the other cleaners. 2. What type of stains does it clean? 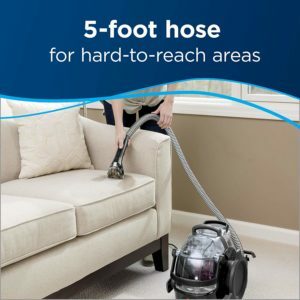 It cleans up all types of spots and messes on the carpets, rugs, stairs and unreachable places. Whether they are coffee stains, pet mess, any liquid spilt or any kind of spot and dirt. No. It is light weighted specially for the house wives who may be pregnant at times, or are weak and fragile, or old, and need convenience. Summarizing all, the new Bissell 3624 comes with all the features and benefits that home people need and want. The cleaner size and its ability to reach difficult places reduces time consumption. Its performance provides a really good solution to the daily cleaning. It is easy to store, carry and move around. The two tank system and large tank saves the re-filling irritation and time. The cleaner comes in handy for all types of stains and spots and makes the carpets and rugs newer and cleaner than ever.